"What happened to my bird?" Trying to determine the behavior of an animal can be difficult when reading the data directly from the messages or looking at a list. Plotting data from variables through time can simplify the analysis process and help to identify a change in behavioral patterns. 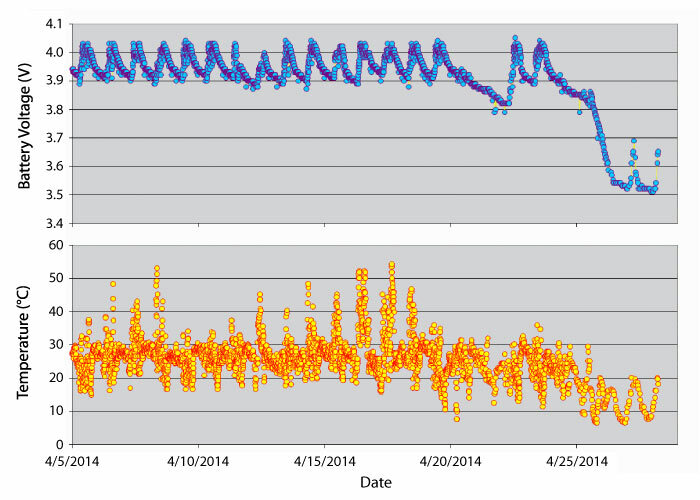 Example: The graph above contains sample data that shows a period of "normal" temperature and battery voltage fluctuations, followed by a marked drop in battery voltage and temperature. 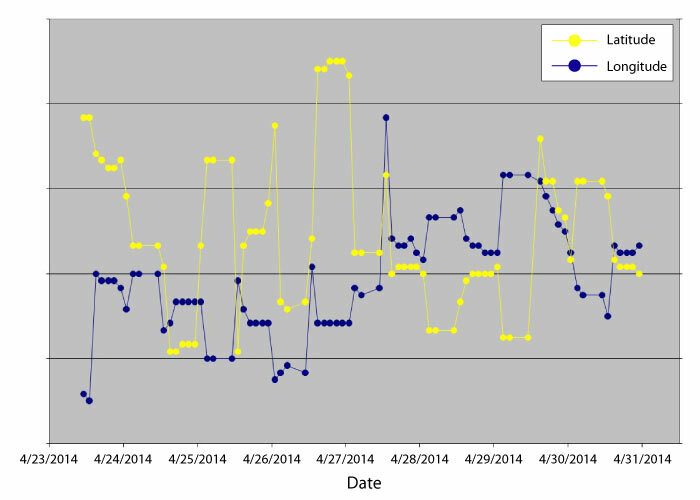 Such a decline may be indicative of bird mortality or transmitter detachment, particularly if there is a concurrent lack of activity, as shown in the graph below. 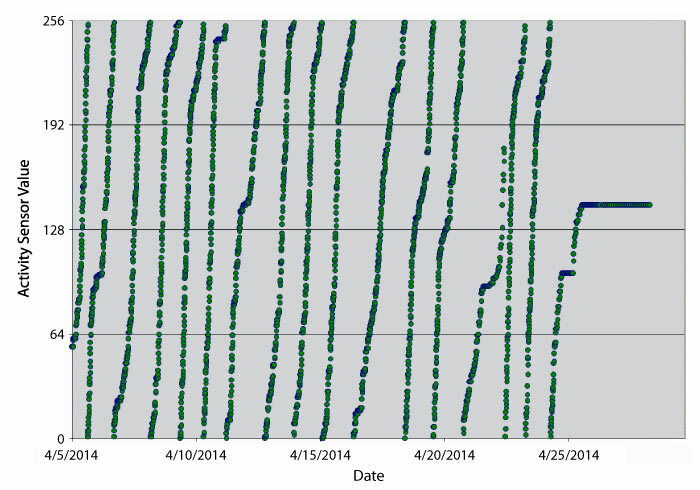 The plot of activity sensor data from one of our GPS/GSM transmitters clearly shows a change in behavior before messages stopped being received. Google Earth™ is a great tool for mapping your animals' location and travels, but it can sometimes be difficult especially when working with the time slide bar. Graphing the latitude and longitude independently may give more insight into an animal's movements. Example: A customer was concerned that one of his GPS transmitters might be down (due to bird mortality or transmitter detachment) as the temperature and battery voltage had dropped for several days. A quick look at a graph of latitude and longitude data showed us that the locations were changing by distances greater than the margin of error for GPS; from this we could conclude the animal was still active. Looking at just a small section of data can lead to misinterpretation. When examining a full dataset, it is easier to detect trends and gain insight into "normal" behavior for a particular animal and what represents a deviation from previous behavioral patterns. When looking at Argos/GPS data, keep in mind that the time a transmission is made during a satellite pass ("message time") is not necessarily the same as the time when the GPS fixes were taken ("location time"). Argos/GPS PTTs take location fixes at programmed hours, then transmit those data to the Argos system at a later time. Be careful to distinguish between the two when analyzing your data. Can my PTT be programmed to transmit at the same time every day? No. The Argos-equipped satellites are in a sun-synchronous orbit, meaning that they pass over the same area at about the same time each day. Our PTTs are programmed to transmit at different times of the day to avoid repeated transmissions during a time when there is little or no satellite coverage. Doppler (non-GPS) PTTs operate on an ON/OFF duty cycle that should not use cycle times which are multiples of 12 to prevent transmissions from regularly occurring at the same time each day. PTTs with GPS capabilities are programmed to transmit during alternating quadrants of the transmission day for the same reason. Varying the transmission times is meant to ensure that there are no large data gaps due to relative PTT-satellite positioning. Why did I stop hearing from my transmitter? There are many potential causes for discontinued communication from a transmitter. The most likely reason for a solar-powered transmitter to stop transmitting is that it is not receiving enough sunlight to sufficiently charge the battery. This can occur due to feather coverage, poor weather, or habitation of a bird in an area with limited sun exposure. Once the transmitter receives enough sunlight and the battery has recharged, a transmitter will resume transmission. GPS/GSM 20-70 Transmitters must be within range of the cellular network in order to send data. When birds stay out of range of the GSM network, data will not be transmitted, but will still be archived (up to 258,000 GPS fixes). Upon future connections with the GSM network, the archived data will be sent, starting with the most recent. Unfortunately, if a bird dies out of range of the GSM network, any unsent data cannot be transmitted. GSM transmitters that are recovered can be returned to us for extraction of the complete archived dataset. How can I tell if my bird is dead? There are no obvious characteristics in a dataset to distinguish between a dead bird and a detached transmitter. Both often result in a drop in temperature and activity, and can sometimes lead to discontinued transmission. Detachment may occur due to improper harnessing, rough treatment of the device by the bird, or human interference. Many users have been able to recover downed birds and transmitters by using the most recent location messages or our Ground Track (GT™) feature. Why did I receive identical GSM emails in the same day? Before GPS/GSM 20-70 Transmitters send data, they first transmit an identification message to a nearby cell tower to establish a connection with the GSM network. Once the connection is made, the transmitter will send any data it has archived to be uploaded to the GSM servers, and the servers pass on that data to the user via email. Throughout the day, the servers scan the incoming datasets for changes and send a new email each time any are detected. However, if a transmitter attempts to establish a connection with the GSM network, but the connection is not strong enough for it to transmit data, the servers will still send an email of the existing data to the user. Receiving several of these identical emails is often an indication that the bird is in an area of poor reception. Why are there some outlying points in my data? Large datasets are more likely to have statistical outliers. Outliers can result from transmission interference, transmitter damage, or an occasional erroneous sensor reading. To help reduce data error, our engineers have programmed our GPS-equipped avian transmitters and satellite fish tags with a CRC checksum to detect most incorrect data messages and remove them for a more reliable final dataset. If statistically improbable outliers (such as an altitude reading above any reasonable height) are causing your data to become skewed, try removing any implausible data points beyond a reasonable threshold measurement and replotting the data. Can you look at my data if I am uncertain what it means? Sometimes, looking at data in a different format can reveal patterns and provide clarity. Use the methods listed at the top of this page to reexamine your data and see if any answers emerge. If you have tried these methods and are still uncertain, please send us your raw, unparsed Argos data (in PRV/A DS format) and we will look it over. Please send more than just the data that are causing you concern. By looking at a larger data sample, we can see the "typical" behavior of your study subject and use that to better understand any changes in the data over time. If my PTT is equipped with GPS, should I still look at the Argos Doppler locations in my data? PTTs with GPS capabilities take location fixes at specified hours and temporarily archive them. When they transmit those positions to the satellites, Argos uses the Doppler-shifted frequencies to determine each PTT's location at the time of transmission, the same way that it does for our PTTs without GPS. Ultimately, users receive two sets of location fixes: one set of GPS locations from the PTT and one set of Doppler locations determined by the Argos satellites. Although GPS locations are more precise, Argos Doppler locations can still be useful. The amount of battery voltage necessary for a PTT to take a GPS fix exceeds the amount of power needed for it to transmit. If a PTT does not have sufficient battery voltage to take GPS fixes, users will still receive Doppler locations from the next time the PTT transmits. The accuracy of the Argos Doppler locations can also suggest why there may be gaps in a dataset. Doppler location accuracy and the amount of messages received by Argos during a satellite pass are indicators of how well a PTT is being "heard" by the satellites. Data gaps that correspond with Doppler locations of a lower location class often mean that a PTT's transmissions are not successfully reaching the satellites or are corrupted when received. What are the possible reasons my PSAT stopped recording light levels?